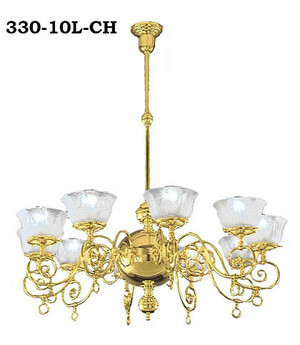 This is a lovely antique reproduction of an Oxley gas chandelier from 1880. It is a nice gentle Americana light with the simple grace of the period. Rated 100 watts per socket. These fixtures require a 4" gas type fitter shade. Shades are sold separately. 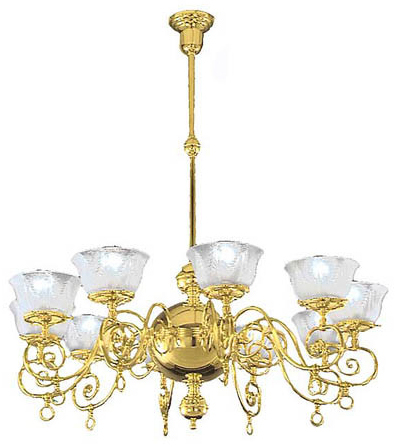 We picture 068G as a suggestion, but with as fine a chandelier as this, you might appreciate 0175G, an authentic reproduction hand-blown crown shade. Shades are sold here. Measurements: 46" tall, but can be shortened to 22" high on request.